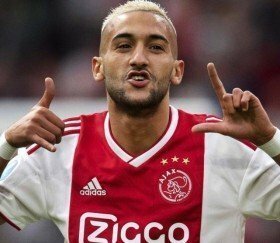 Ajax youngster Hakim Ziyech looks set to make a move to Premier League giants Liverpool, despite the reported interest of bitter rivals Everton. The attacking midfielder has been in stunning form for the Eredivisie side so far this campaign, attracting interest from dozens of top European clubs. Liverpool manager Jurgen Klopp is a big fan of Ziyech and it is understood the Anfield club are ready to spent 15 million euros to bring the midfielder to England in the upcoming January transfer window. The agent of the player, Rene van der Gijp, told reporters of the possible move away: "I hope that there will be a better club than Roma – an Arsenal or Liverpool. However, when the agent had been asked about a move to Everton, he responded: "That would be crazy for that boy, he should not go to Everton." 25-year-old Ziyech, who arrived at Ajax after spells at Twente and Heerenveen, has 22 caps for his country Morocco and has scored 10 goals at international level. Ziyech has two years remaining on his deal in Amsterdam.